Well, as many will know, the trip to Iceland was postponed. I’ve been having a bit of a sulk about it for a couple of weeks (hence no posts), but as it was entirely my decision to postpone it I shouldn’t be too moody about it. However, whilst I feel like I let myself down a bit, it does appear that it may have been a good decision to wait. There were a couple of reasons for postponing the trip. First: The cost. It was going to come in at just over £3000 for what amounted to 19 days, including international travel. Whilst Antarctica was well over double that for a mere 13 days Iceland doesn’t fall into the ‘once in a lifetime’ category. Not that it isn’t a stunning place to visit, but rather it is a place I could go several times. I knew from the start that Iceland is on the expensive side, and I’m not one to shy away from spending money, but when I spend it I have to feel that I’m not wasting it and it was this feeling I was having trouble shaking. I eventually traced my concerns down to the itinerary and my plans to drive around the whole country. I use Google Maps a lot when planning trips and you can probably understand my concern when you see where I’ve tagged key points of interest. As can be seen the majority of points are down along the southern coast. There’s an important cluster up toward the northwest – important as it includes Dettifoss and Myvatn – but other than that I would be travelling large distances for only single locations. It just wasn’t a good split of ‘expensive’ time and it was too late to change hotel bookings. The second point that kept niggling at the back of my mind was it’s a lot to take on by oneself. I’m certainly no stranger to solo travel and often prefer it as it allows me to spend time setting up shots and exploring angles. But, Iceland is very capricious and should something happen and you’re out of cell coverage then you’ve got a problem. I had been taking steps to mitigate risks, of course, but one thing my day job has taught me is that you cannot project plan every eventuality. Coupled with this is the fact that a lot of the sense of wonder in landscape photography comes from a sense of scale. This is something Iceland’s vistas have an abundance of and so much of showing the vastness of its landscapes come from including a convenient reference point – and what is more convenient than a handy human? So, with the above in mind and despite the kill date being passed, I cancelled the bookings. In the end I lost around £200, but compared to £3000+ I would have spent, I could accept that and the rescheduled trip in 2014 would be more focussed, less grandiose, and more productive. And, of course, I can always go back if I miss anything. Now, as with many things in life, good things can come out of grim situations. In this case, an unexpected message on Facebook from someone I’ve known for many years. He’s a keen rock climber with a love for the outdoors and he’s very interested in going to Iceland. Now this has several benefits, not least the cost drops significantly. It’s also safer travelling with someone should the worst arise. The other benefit here is that I know nothing of rock climbing and so to have a subject that not only lends a sense of scale, but does it in an adventurous way -and in a way I never could – is a real benefit. There’s lot of planning to do. My schedule is largely out the window as with two people to consider it’s all about accommodating both wish lists but, given that the reason he wants to visit is going to make for some great photography, I really see this as a benefit – certainly more entertaining than my original, somewhat stuffy, plans. As I said it is early days, but I do hope we can come to an arrangement. Today marks the kill date for the Iceland trip; the date after which cancelling would incur significant financial losses. So, have I pulled the plug, or am I now financially committed? Of course I haven’t, but that just means a lot more work to do. With less than two weeks until I fly out to Iceland, there is still a fair bit of planning to take care of, and the task of getting everything in order before then is made more challenging by the fact that I’m away on business this week and working next weekend. On the plus side, being stuck in a hotel for the next few evenings should minimise the distractions and the wonder of cloud storage providers such as Evernote and Dropbox means that, after spending weeks on my multi-monitor behemoth of a computer at home collecting information and distilling it into a Word document, as I opened my laptop at the Premier Inn hotel here in Grimsby, UK, a few moments ago all my work seamlessly appeared. When it works, technology is great. Having my notes magically appear, however, doesn’t detract from the fact that I’m short for time. For week-long city breaks, it really would not be an issue as you can easily make last-minute changes on the fly – you can even just make the whole thing up as you go along and make a success of the trip. On the other hand, when travelling across a country, and you have a purpose – say photography – then at the very least you need a framework. I set out a rough framework in a blog entry a couple of weeks ago largely based upon the fact that I had booked accommodation in various places around Iceland. Since then, I have continued to scour the Internet for interesting, and potentially photogenic, sights and it has been no surprise that I’ve found more things I would like to see. This has brought about the inevitable checking to see if I can change accommodation so I can spend time in the new place, which has had the knock-on effect of having to decide which of the original planned sights would be culled in order to free up time. In short, I was dangerously close to undoing a lot of basic, but critical, planning I had completed. But, that would likely be disastrous this close to the start date and so I must simply accept that the accommodation – and hence the sights – are largely fixed. Well, not quite. The framework thankfully does allow for some modification, especially when using Reykjavik as a base camp. As mentioned in a previous post I have three days for Reykjavik, one without a 4WD rental and two with. The plan is spend the first day investigating the city on foot and getting back into the right mood for seeing things photographically – a step I have to pass though on every trip. The following two days were, up until this weekend, rather vague. Now they have shape and meaning. 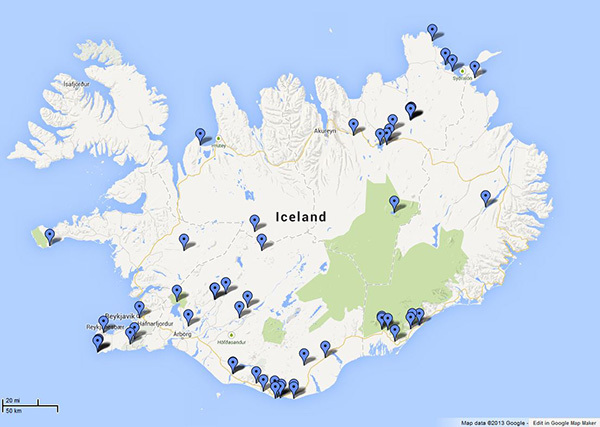 On one of these days I plan to investigate the Reykjanes peninsula, which for many visiting Iceland is famous as the home of the Blue Lagoon – and the international airport. However, I may very likely completely bypass the tourist magnet altogether in favour of some seriously photogenic coastlines, complete with menacing rocky spires and crashing waves. Throw in some monster storm clouds and I’ll positively grin like the Cheshire cat. Aside from the coastline, there are a couple of lighthouses, some nice mountains and some lakes. But what has really captured my eye is the geothermal power station which, whilst I perhaps haven’t sold it very well, I can see some real photographic promise in. Whilst the day is relatively local to Reykjavik, I’ll be getting used to driving the 4WD and, as some of the roads out on the peninsula are gravel, not paved, it’ll be an adventure nonetheless. The second day is going to be a bit of a marathon, involving some 400 kilometres and seven hours of driving. The plan is to drive up to the geysers Stokkur and Geysir, from there head up to Gulfoss waterfall and then, and this is the time consuming part, up to Gygjarfoss waterfall. I say time consuming as the road ends after Gulfoss and becomes a highland, or F road. In other words, it’s a dirt track. Even in the 4WD I’m not going to be traveling very fast on that. My hope is to spend a couple of hours at Gygjarfoss and head back at about 3-4PM so I can arrive at Thingvellir National Park for dusk. So, another two days now have shape and slowly I’m beginning to have some faith that I will see the things that I would like to see. There will be much that I have to miss, but that’s where organising a photography expedition is like life: It’s all about knowing when to quit and just be happy.